This calendar contains AA related events for District 22 of Alcoholics Anonymous. All events are reviewed by CCCOI volunteers and are accurate to the best of our knowledge. If there are any corrections needed please contact us. If you would like to add an event please send it to us via the Event Submission form. 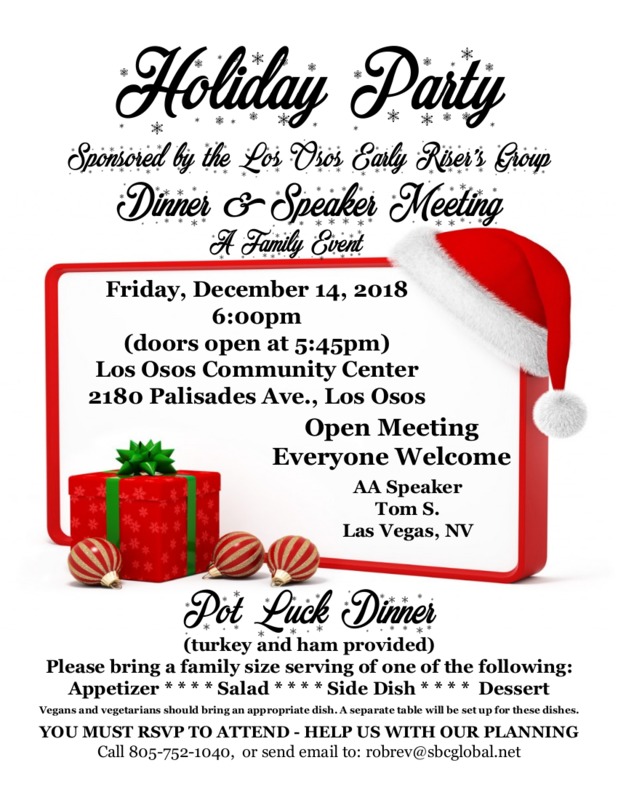 You are invited to join the Los Osos Early Risers Group at their annual Holiday Party on December 14, 2018. The party starts at 6pm and is located at the Los Osos Community Center, 2180 Palisades Ave. The event includes a pot luck dinner (Early Risers provides the ham and turkey) followed by a 50-50 drawing and a Speaker Meeting. Our speaker this year is Tom S. from Las Vegas, NV.